I’m thrilled to be covering a number of selections from the 56th Annual New York Film Festival, which takes place September 28th-October 14th. The Coen Brothers have what some might call a unique touch. Their films are often uproariously funny, but usually also involve murder and mayhem. “No Country for Old Men” and “Fargo” are probably their biggest successes, though they’ve had other Best Picture Oscar nominees over the years. Their stories – and their characters – are peculiar, and almost always have a penchant for long-winded speeches that convey an intellect far beyond what might be expected. Not every effort by this duo is a success, and aiming too broadly for either comedy or drama without the knowledge of where to meet in the middle can produce an uneven result. 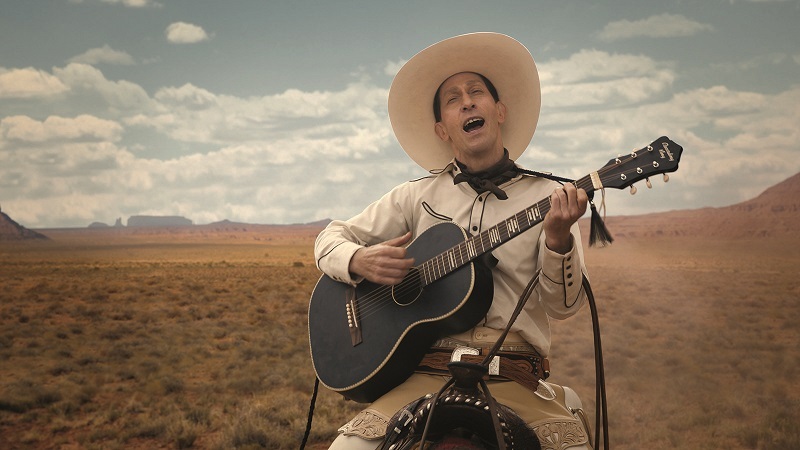 “The Ballad of Buster Scruggs” is merely the first chapter of this six-part collection of unconnected stories. Tim Blake Nelson is a showy, singing cowboy in the first, James Franco is an unlucky robber in the second, Liam Neeson is a traveling entertainer in the third, Tom Waits is a prospector looking for gold in the fourth, Zoe Kazan is a young maiden in search of a better life in the fifth, and Tyne Daly is one of a few nervous passengers in a stagecoach in the sixth. Other well-known actors and breakout newcomers accompany them and appear in various roles throughout this assembly of predictably outlandish tales. The Coen Brothers have never been afraid to try something new, and they expressed at the press conference at the New York Film Festival that they didn’t ever think they’d be able to get this project made. While it is an impressive undertaking emboldened by great costuming and art direction, it suffers from being disjointed and, at times, purposeless. The bigger issue is that its first segment is so spectacular and entertaining that everything that comes after can’t possibly compare. The other five are also more serious and unpleasant in nature, which the Coen Brothers have done well in the past but doesn’t work too well here, especially in the film’s third road show act segment. Nelson, who plays the film’s title character, is the undeniable star of this film, and it’s a tremendous, hilarious performance that sets the film off to a superb start. In the film’s penultimate segment, Kazan, Bill Heck, and Grainger Hines enhance their material considerably with involved and engaging turns. The smallest role that proves truly unforgettable features the reliable Stephen Root as a bank teller not about to be robbed again in what serves as the film’s funniest moment aside from the entirety of its opening act. Whether this film needed to exist as it is with its parts together is up for debate, since the quality of its first segment really overshadows and dwarfs the far less worthwhile rest.